Investing.com – West Texas Intermediate oil extended gains in North American trade on Wednesday, after data showed that oil stockpiles in the U.S. fell sharply. for August delivery on the New York Mercantile Exchange gained $1.97, or 2.7%, to trade at $72.50 a barrel by 10:32AM ET (14:32GMT) compared to $71.92 ahead of the report. The U.S. Energy Information Administration said in its weekly report that fell by 9.891 million barrels in the week ended June 22. Market analysts’ had expected a crude-stock draw of just 2.572 million barrels, while the American Petroleum Institute late Tuesday reported a decline of . 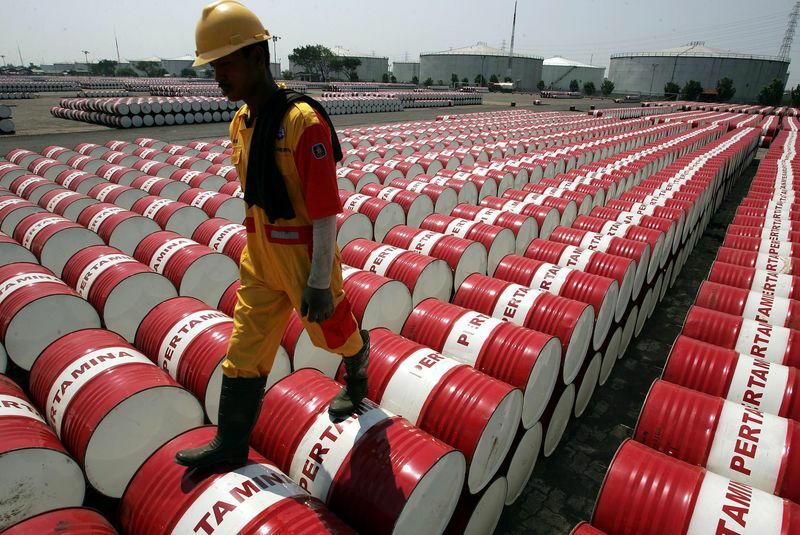 , the key delivery point for Nymex crude, decreased by 2.713 million barrels last week, the EIA said. Total U.S. crude oil inventories stood at 416.6 million barrels as of last week, according to press release, which the EIA indicated was about 4% below the five year average for this time of year. The report also showed that increased by 1.156 million barrels compared to expectations for a build of 1.313 million, while edged forward by 0.015 million barrels compared to forecasts for a gain of 0.774 million. Elsewhere, on the ICE Futures Exchange in London, for September delivery gained $1.53, or 2.0% to $77.40 by 10:37AM ET (14:37GMT), compared to $77.67 before the release. Meanwhile, Brent’s premium to the WTI crude contract stood at $9.74 a barrel 10:39AM ET (14:39GMT), compared to a gap of $5.36 by close of trade on Tuesday. Oil had already been heading higher ahead of the release on Wednesday on reports that U.S. officials urged all countries to stop Iranian crude imports from November. The U.S. has told countries to cut all imports of Iranian oil starting from November, a senior State Department official said on Tuesday. Also, last Friday’s decision by the Organization of Oil Exporting Countries (OPEC) to raise output remained in focus. While the agreement was widely anticipated, the supply boost was less than some investors had anticipated. The OPEC agreed to a nominal increase in production of 1 million barrels a day. While OPEC members will add around 700,000 barrels a day, non-OPEC oil suppliers led by Russia would add the rest. OPEC and non-OPEC partners including Russia started withholding supply in 2017 and cut output by 1.8 million barrels per day (bpd) to prop up prices. The group’s crude output has been below the targeted cuts, with compliance at 152% in May, but the cartel now plans to reduce that compliance to 100%, thus increasing current output. Elsewhere on Nymex, for August delivery gained 3.7 cents to $2.1026 a gallon by 10:42AM ET (14:42GMT), while the August contract for traded up 4.4 cents to $2.1764 a gallon.